INDIA hasn’t tasted success in test match series in England since 2007, as England bowlers continuously showing their form in their country. They know their unconditionally pitches what the bounce and the swing on the wicket. After winning the t20 series INDIA faces the loss in one-day series against England. What should be the outcome of this series, hoping this will be in favor of India. It hasn’t rained there much last few weeks, this will result in wicket drier and should bring Indian spinners into the play. India having three frontline spinners- R Ashwin, Kuldeep Yadav and Ravindra Jadeja. I am impressed by Kuldeep Yadav’s bowling attacking strategy, he also brings a new variety in the Indian bowling line up. Kuldeep and Ashwin are the good combinations to continue with test series “While facing Indian spinners, spend your time on the wicket, you can’t just take a particular shot against them especially sweep shot. You have to be patient to score runs slowly through spinners and to use your feet as much as possible” said Lamb. Eoin Morgan(C), Jonny Bairstow, Jos Buttler, Moeen Ali, Sam Curran, Jake Ball, Tim Curran, Alex Hales, Lian Plunkett, Chris Jordan, Joe Root, Jason Roy, Adil Rashid, Ben Stoke, Mark Wood, Dawid Malan, David Willey. 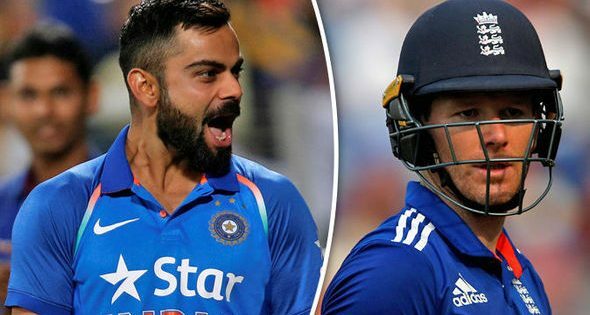 Virat Kohli(C), Ajinkya Rahane(VC), KL Rahul, Shikhar Dhawan, Murli Vijay, Cheteshwar Pujara, Dinesh Kartik, Karun Nair, Rishabh Pant, Ravindra Jadeja, R Ashwin, Kuldeep Yadav, Shardul Thakur, Hardik Pandya, Mohd. Shami, Ishant Sharma, Jasprit Bumrah, Umesh Yadav.